Hindiba is a plant of Middle Eastern lands. Its therapeutic value as a drug for the treatment of various diseases, including cancer. The following detailed study by Professor Nil Sari investigates the historical and medical aspects of the hindiba in Islamic and Ottoman Turkish medical traditions. This short article introduces the full paper by Professor Nil Sari which is published here as a full article in the 41 page PDF file. The article presents a long, detailed and well documented study on a drug, extracted from a plant named hindiba (hindiba in Arabic ancient sources). This plant was known to Muslim pharmacologists and herbalists and its therapeutic values were studied in Islamic medicine, from different angles. The author, Professor Nil Sari, an internationally recognized historian and scholar, from Istanbul University, endeavours to emphasize the precedence of Muslim use of such a herb for cancer healing long before present day doctors. Her article is a rich study, very well documented and supported by a solid critical apparatus, consisting in a detailed list of bibliographic sources, sets of notes and references, a list of 23 original manuscripts, all of them used in the article. Her study is furthermore highlighted by illustrations. Presenting a detailed account on the theoretical background of the invivo and invitro experimentations with herbal extracts from Turkey, the study starts from the philosophy of the Ottoman Turkish medicine, which has its roots in the Islamic medicine, and states that the drugs Cichorium intybus L. and Crocus sativus L. were identified as identical substitute plants for each other in terms of their active components for cancer treatment. Doctor Hanzade Dogan and Professor Nil Sari planned to search for the compounds in C. intybus L. and saffron from Safranbolu, as it was claimed in old medical texts that there is a compound in saffron, which was said to act as a transporter for the active compounds for cancer treatment in itself and in C. intybus L. to cross the cell membrane. Crude extracts of both were tried in animal experiments in Turkey at DETAM (Center of Experimental Medical Research of Istanbul University) in 1989, ending up with promising and exciting activities. Since C. intybus L. was much cheaper and easily available, the two scholars continued their experiments with intybus. From 1990 to 1994, Dr. Dogan was sent by the Istanbul University to Boston University, where she took part in invivo and invitro experiments at the Departments of Immunology and Pathology. It was Professor John F. Snyder of the Department of Chemistry of Boston University, who carried out chemical analysis of the herbal extracts prepared and sent from our Department during the period. The first pure and novel compound isolated by J. Snyder was from C. intybus L. extract. Later, J. Snyder produced the drug's natural analogues and synthetic derivatives, while H. Dogan tested their bioactivity, some of which are included in the patent published in 1997. In accordance with an agreement between Boston and Istanbul Universities in 1992, claims of both parties were put down. These studies were composed and presented as a paper in the 212th American Chemical Society National Meeting in 1996, where the paper was granted the Fellowship Award. Two patents were produced on these subjects, an international one in 1995 and a United States patent in 1997 (see Methods for treating neoplastic disorders, US Patent issued on September 2, 1997: http://www.patentstorm.us/patents/5663196-description.html). In her full article published in PDF format, Professor Nil Sari says: "The following paper explores the process by which these and similar drugs were used in the past as medicaments for the treatment of cancer as well as several other diseases. I felt the need to raise this discussion because the rediscovery of this drug is a proof to the share of the historical background in the rediscovery of this drug". Medical literature of the past is a source of information which has the potentiality of suggestions to the contemporary scientist. This is a different approach to medicine in history from regarding it as an alternative to the contemporary medicine. This different view of medicine in the past and its philosophy on a wider perspective will enable us to evaluate old medical literature more objectively and utilize it. Above all, when we study old materia medica, we discover material that can be utilized and be conscious of the bridge between past ages and ours. This study attempts to convert the combination and welding of the past and contemporary medicine into one corporate whole. When we have a closer look at the old texts we see the truth that we know far too little about the herbal remedies of the past. Contrary to our attitude, the physician in history paid the greatest importance to herbal medicine, not only because surgery had not progressed enough, but also because they believed that the secret through which the equilibrium of health was to be sustained and restored lied in herbal medicine. It is not vain to believe that knowledge of the ancient usages of drugs can lead to the discovery of new drugs. Therefore, it is of great importance to identify the drugs used in history and carry out experiments with them in laboratories. 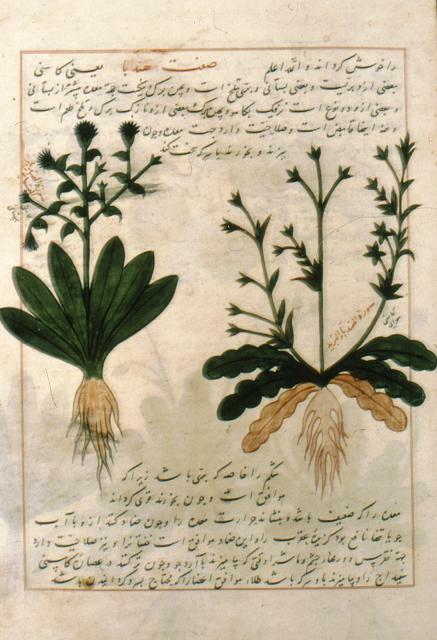 Starting from this principle, the sources of Muslim and Turkish medicine were analysed from the angle of exploring the properties and benefits brought by the plant hindiba. The ancient Islamic sources used in this research are principally the Canon of Medicine of Ibn Sina and the work of the Andalusian herborist Ibn al-Baytar, who collected his impressive list of drugs from the different regions of the Islamic world that he visited in person. Such a study puts different challenges to the scholar, such as the investigation of the structure of books on simple drugs, the question of the theory of the nature of drugs, the relation between theory and practice in this medical and pharmacological literature. After that, the study focuses upon Ottoman medical literature in Turkish before the 19th century, when western medicine was introduced and modern medicine and pharmacology took the place of the old. Figure 1: The cultivated and the uncultivated kinds of hindiba are illustrated in a schematic way. (Dioscorides. 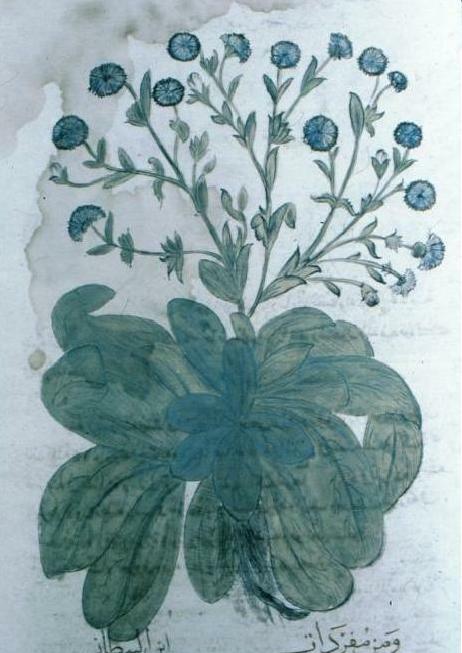 Materia Medica. Translated by Abdullah el-Huseyin b. Ibrahim el-Natili. Kitabu‘l-hasa‘is. Topkapi Museum Library. Registered at section Ahmed III., No: 2127). Then the rest of the study is devoted to the drug hindiba, and its different varieties are described, mainly its main two groups: the cultivated (bostani) and the other uncultivated (berri). A rare and third kind is classified as wild (yabani); it is identified in some texts with the uncultivated. Various drugs are named after both the cultivated and the uncultivated. The varieties of the two main groups are studied on the basis of Ottoman medical sources, such as Osman b. Abdurrahman, Isa Efendi, Fazlizade and Yirmisekizzade, Mehmed Mumin, and even Ibn Sina's Canon and some materia medica works of modern Western scholars who dealt with the Ottoman herbalist tradition. The therapeutic properties of hindiba are based on medical theoretical considerations, asserting that the medical effects of drugs operate in accordance with the nature of the constituents. The constituents resulting from decomposition will have effects called power. The potential hot and cold qualities contained in the nature of the drug will come forth as a result of the decomposition in the body. The active component which is hot in nature will act promptly. It will diffuse through tissues effectively. The hot constituent acts before the cold constituent and clears the barriers in the passages of the body and prepares the way for the passages so that the cold constituent can diffuse. Later, the cold constituent comes in and carries out its function. It is in this perspective that hindiba is applied in the the treatment of tumours. According to different sources, hindiba has the power to treat several diseases, its therapeutic value having been considered as a specific characteristic of its substance. Hence, hindiba can clear away obstructions of the passages in the body, specially in the digestive system. But the most spectacular domain to which its power was applied concerns the healing of tumours. All kinds of swellings, new-growths, lumps and other nodosities are classified under the general term waram (verem). Whether an inflammatory swelling or a mass is meant can only be comprehended in the context. Formation of new tissue and inflammatory swellings are agents causing obstruction of the channels. Cancer is described as a hard mass and is called seretan, because it was likened to a crab. Identified as a hard swelling, cancer was said to be as small as a chickpea at the beginning, then it grew larger, along with increasing pain and the degree of pain increased with the amount of bile mixed. It is described as a fatal illness. Ibn Sina notes that a cancerous tumour progressively increases in size, is destructive and spreads roots which insinuate themselves amongst the tissue elements. We find similar descriptions of it in Ottoman medical manuscripts, such as the kinds of tumours called cancer are those which spread all through the body, that is metastasizes, grows roots like trees and stick to the organs. 1- According to the different kinds of matter of which they are made, for instance, as to the humors concerned. 2-Tumours are also classified as hot and cold inflammatory tumours. Tumours which are colored and feel warm when touched are usually called hot tumours, while a colourless tumour which does not feel warm is called a cold tumour. Although it was discussed in old medicine whether cancer was a hot or cold tumour, Ibn Sina notes cancer among the cold tumours. When viewed from the humors point of view, cancer is classified as an atrabilious tumour. Cancer appears in the Canon as a disease associated with change in the atrabilious humor (the black bile). Cold and dry in nature, the atrabilous humor, is normally formed as the sediment of good blood. After having arisen in the liver, one portion of it goes to the spleen and clears the body of the effete matter. The abnormal atrabilious humor is formed from an oxidation of the bilious humor mixed with putrefied blood. The natural yellow bile (bilious humor) is the foam of the blood, which is formed in the liver. But, cancer formation is admitted to be a result of blood mixing with bile and oxidation which causes it to turn into atrabilous humor. The factor underlying this is an excess of blood which can not flow and will collect and will be kept unused and putrefied. This corruption and putrefaction causes the formation of leafy matter with an acidic character which leads to obstruction in the channels. Obstruction prevents the flow of tissue fluids and is the forerunner of disease. If a swelling is an atrabilious mass, hard to the touch, then, a hot drug which resolves and disperses matter and which opens blockages is advised. When a physician of the old medicine comes across such a piece of theoretical information as mentioned above noted in relation with a drug as hindiba, he would assume that it is a drug advised for the treatment of cancer. Therefore, the main factor in the formation of cancer is the merging humors into the metabolic cycle in a pathological manner. When we look through this process and the relation of the yellow bile with the liver, black bile with the spleen and the pathologic changes in the humors and the obstruction of channels as a result of putrefaction and the relation of this process with the digestive system, we can see the therapeutic values of hindiba in the tre¬atment of cancer from the perspective of the practitioners of the old medicine. The above said comment on the etiology of cancer according to the humoral pathology; and the assumed relation with the digestive system interestingly resembles the recent hypothesis developed that, "dietary fat increases the excretion of bile acids, which can be converted to carcinogens or promoters." Still more interesting is the results of our laboratory researches which show that extracts of C. intybus L. were found to be most active on colon cancer. Figure 2: Hindiba as illustrated in Kitab min al tibb fi‘l-ahkami‘l-kulliyyat ve‘l-edviyatu‘l-mufredat. Suleymaniye Library. Registered at section Ayasofya, No: 3748. When we study the therapeutic values of hindiba in materia medicas, we see that it is rarely mentioned clearly as a drug for the treatment of cancer; but hindiba is sometimes directly advised as a drug for the treatment of tumours. For example in the translation of Ibn al-Baytar it is noted that if the juice of squeezed hindiba leaves are heated, its foam taken and filtered and the juice drunk it would be beneficial in treating tumours. Mehmed Mumin notes that hindiba removes tumours in the internal organs. Yet, it is often advised for the treatment of the tumour of the throat. Several authors note that if cassia is macerated in hindiba juice (specially the cultivated kind) used as a gargle would be beneficial for the treatment of the tumour, pain and inflammation of the throat Cassia fistula L. was used for its power of maturating and dispersing inflammations in the internal organs. There are few exceptions in the medical manuscripts on general medicine where hindiba is specifically advised as a drug for cancer. A remarkable example is Salih b. Nasrullah, who defines cancer as a terrible illness which is caused by matter born from burned blood and bile. Advising both operation and medical treatment, he warns that its nature is difficult. As it is surrounded by many vessels, it is called seretan, meaning the crab. In its early phase it is a small tumour as a nut and even smaller. It becomes manifest with pain. The pain increases along with its growth and its colour tends to be dark. When incised, a disgusting smell spreads. The diagnosis of cancer is difficult. At the beginning of the treatment, the body must be purgated from the hot humors. Here we see that pills prepared from Fumaria officinalis L. is used for purgating corrupt humors and its syrup is used to bring the temperament to equilibrium. Following this, the application of tender hindiba leaves on the tumour is advised. "If black bile is mixed and dark in colour, drink hindiba juice. If it is said to be very bitter, add sugar. It will also be beneficial to the spleen, removing the heat of blood and bile." (The role of the spleen in the immunological process can be noticed here). If the black bile was caused by burning of the bile, that is when there was a sign of atrabilious humor being mixed with putrid blood, this meant that it was cancerous. Then some suggest common fumitory to be added to hindiba juice. Here we also find the activity expected of fumitory in the treatment of cancer. Though generally believed to be a fatal illness, there were several writers of the Ottoman period who believed that it was possible to dissolve the insidious matter and prevent its growth and extirpate the ulcerated cancerous matter, by using therapeutic drugs, that would help in the resolution and evacuation of the abnormal atrabilious humor instead of or besides surgery, and cauterisation which was practiced in treating external tumours easily demonstrated to the sense of sight. Although the theory of medicine and the definitions of illnesses and their therapy in the old medicine are quite different from those of contemporary medicine, a system of its own which works out in itself can be discerned. As we have seen, the efforts of treatment are directed to the cause of illness, but the idea of the nature of the cause is approached from a philosophical point of view. Therefore, if we can establish a good relation between the philosophy of medicine and practical therapy and if we review the general principles of illness and treatment, we can find useful clues that can be used for research aiming the treatment of some cases which do not well respond well to today's methods. Experimentation of hindiba and saffron as drugs in the treatment of cancer and as immunostimulators are but a few examples.